The Wisconsin State Knights of Columbus recently presented Bishop William Patrick Callahan with a check for $2,500 from proceeds generated by their 2016 Intellectual Disabilities (ID) Campaign (a.k.a. Tootsie Roll Drive). Bishop Callahan will direct these funds toward programs assisting persons with intellectual disabilities within the La Crosse Diocese. 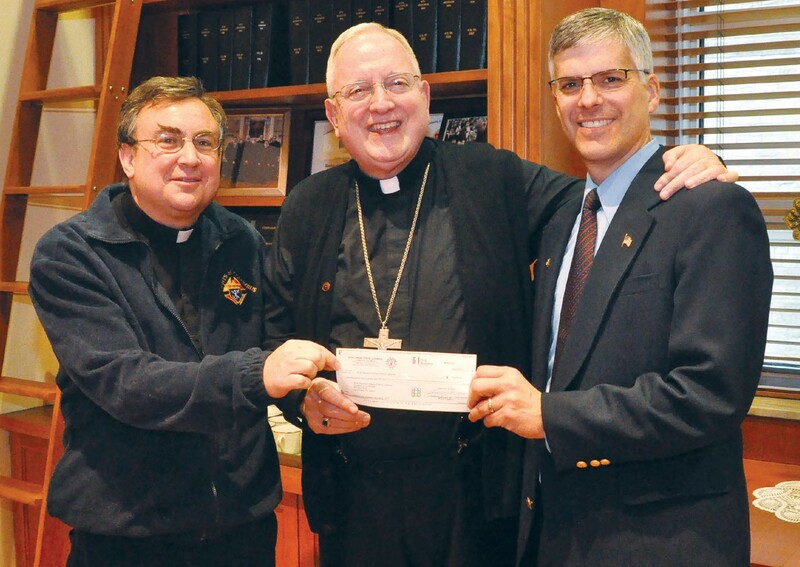 Presenting the check are Father Timothy Wells, La Crosse Diocesan Chaplain for the Knights of Columbus and pastor at St. Joseph Ridge Parish, and Greg Sutton, State ID Committee member representing the diocese. The Knights are grateful for the many generous contributions to this important annual campaign and reminds everyone that the 2017 drive is coming up again in the late April – early May time frame. Your support does make a difference!